1. We’ve see plenty about accused Ponzi scheme operator Earl Jones, but this article gives some insight into how he found his clients and preyed upon people at their weakest moment. 2. Larry MacDonald reports on a former Nortel employee caught in a tax nightmare. 3. Larry Swedroe has some thoughts for those waiting for a signal to get back into the stock market. 4. Preet explains that Vanguard is owned by its clients which explains the ultra-low MERs. 5. Big Cajun Man marks a full year of unemployment. 6. Thicken My Wallet wonders whether your financial advisor is worth $600 per hour. 7. Ellen Roseman explains why you always have to be willing to leave your bank. 8. Frugal Trader looks at the pros and cons of buying a car in the US and bringing it back to Canada. 9. Blunt Money sums up how to get out of debt in eight words. It’s refreshing to see a little tough love. The Tax-Free Savings Account (TFSA) is a useful new tool for Canadians to reduce future taxes, but the $5000 limit per year makes them of little use to wealthier Canadians. Helping Canadians of modest means is an admirable goal, but you can count on wealthier people to complain. This brings us to Malcolm Hamilton’s proposal for retroactive TFSA room of $5000 per year back to age 18 (proposal details here). Jon Kesselman gave a counter-proposal to give older people more TFSA room each year than young people get (the web page with this article has disappeared since the time of writing). Both of these proposals amount to a transfer of future wealth from young to old. To put a finer point on it, because only wealthier people can make use of large amounts of TFSA room, these proposals would transfer wealth from the young to wealthy older Canadians. Recall the people he proposes get higher limits are the same folks who depending on their age were not taxed on capital gains before '72, at all. ... From the mid 80's until '94 there was a $100,000 lifetime capital gains exemption for all types of property; that exemption no longer exists. My point is the people he wants to give a break to are the same ones who have always been given a break. Being a baby boomer of above average means myself, these proposed TFSA changes would likely help me. But, I don’t want it done on the backs of my children. Entrust, a spinoff from Nortel back in the late 90’s was sold to Thoma Bravo yesterday. Shareholders approved the deal for $2 per share with the required two-thirds majority. The deal was sold strongly by Entrust management. Thoma Bravo intends to leave existing management in place and will pay them cash incentives now that the deal has been approved. It is somewhat ironic that at the same time pieces of Nortel are being sold off to the highest bidder, the Nortel spinoff Entrust was sold to Thoma Bravo. However, it is less clear in the Entrust case that it was sold to the highest bidder. I understood pension contributions were a contractual obligation between the employer & the employee, and the funds were essentially supposed to be held in trust for the employee. Maybe it's time we removed this responsibility from the employer, so it is no longer tempting for them to dip into these trust funds to prop up the company. It’s true that pensions are a contractual obligation between employers and employees, and that the funds are held in trust for the employee. Furthermore, employers are not permitted to directly dip into pension funds. So, how can pension funds get underfunded? The answer begins with a simple accounting game. Consider the example of Badco with a single 45-year old employee, Ed. Suppose that Ed is entitled to $1200/month (adjusted for inflation) from age 65 to 85. This is a total of $288,000. However, Badco doesn’t have to set aside $288,000 right now. Whatever money gets set aside now will be invested and the returns will make it possible for Badco to set aside a smaller amount of money and still have it grow enough to cover Ed’s pension. Suppose that Badco’s pension plan can be expected to earn an average return of 3% above inflation. A few simple calculations show that Badco must set aside $120,200 to cover Ed’s pension. This is much less than $288,000, but is still a lot of money. What if Badco assumes that the pension plan will earn 6% above inflation? Then they only have to set aside $52,900 right now. One little change to an accounting footnote reduces Badco’s pension obligation right now by more than half. Of course, if Badco’s pension plan can’t beat inflation by 6%, then the plan will grow too slowly and the pension will become underfunded. A downturn in the stock market would magnify this effect, and Badco’s pension plan could become severely underfunded very quickly. Unfortunately, at the very time that Badco must make substantial contributions to its pension plan, the economy is in recession, and Badco’s business is in trouble. Instead of filling up the pension plan, Badco is unable to contribute much to the fund at all and is facing possible bankruptcy. Many people are calling for the government to step in and guarantee pensions or create a new universal pension plan that guarantees all retirees a comfortable pension. Unfortunately, demographics make this impossible. Once the bulk of baby boomers have reached age 65, there won’t be enough young people paying taxes to support all these payments. It is as though there are ten people in a room and ten cookies on a plate, but everyone is entitled to three cookies. Something has to give. The most logical fix is to delay payments past age 65. People are living much longer today than they were when the retirement age was set at 65. I’ve said before that a great many Canadians won’t get the pensions they were promised through their working lives. Too many pension plans just don’t contain enough money to cover the promised payments. Recent news about Air Canada adds to this problem. Air Canada’s pension plan holds $2.9 billion less than it needs to hold to cover promised payments, and this deficit is likely to grow because the company has received approval to make reduced contributions to its pension plan for the next few years to avoid another bankruptcy. 1. Air Canada’s business strengthens enough in the coming years that it makes up the pension shortfall (HA!). 2. The government makes up the pension shortfall and retired employees get all of their money. 3. Employees don’t get the money they were promised. 4. A combination of 2 and 3 where the government makes up some of the shortfall. My guess is that outcome 4 is the most likely. I’d like to think that all employees of all companies will get their full pensions, but this appears to be impossible. 1. Larry MacDonald lists some of the organizations that may compensate investors who are the victims of financial fraud. I would hope that these organizations would only compensate victims for lost principal and not fictitious investment returns. 2. Four Pillars educates us on some of the unpleasant tactics used by some real estate agents (the web page with this article has disappeared since the time of writing). 3. Preet explains the origin of Deferred Sales Charge (DSC) mutual funds and how this marketing move was extremely effective at pulling the wool over investors’ eyes. Congratulations to Preet on the second anniversary of his blog Where Does All My Money Go? Check out his big celebration giveaway. 4. Thicken My Wallet gives us the benefit of some clear thinking on the advantages and disadvantages of owning a cottage. 5. Frugal Trader is in the market for a new car and has collected many useful suggestions from readers. 6. Canadian Capitalist explains why it doesn’t much matter whether you buy a dividend-paying stock before or after a dividend is paid. 7. Big Cajun Man saves money by test-driving Wii games borrowed from the library before buying the ones his family like. I’ve seen a great many articles lately arguing against investing in stocks. A good example is an article at Falkenblog that argues that the risk premium is actually zero. Canadian Capitalist does a good job refuting the points in this article, but the fact that so many compelling arguments against stock ownership are being written may be an indicator – or a contrary indicator. Canadian Capitalist concludes that “stocks seem to be priced to deliver a healthy premium in the future,” which is dangerously close to a prediction about stock prices, but I’m inclined to agree. I remain invested in stocks because of the long history of a risk premium, but I’m hopeful that we’re entering a period more favourable for stocks than the last 15 years or so. The flood of commentators arguing against stock ownership make me feel even better about owning stocks now. When we hear of one company being bought by another, we tend to think of the case where the acquiring company intends to run the acquired company itself. This can be bad news for existing management of the acquired company. However, sometimes a company is purchased by “private equity,” which usually means that existing management will remain in place. This will be the case with the company Entrust if the offer from Thoma Bravo to buy Entrust for $2 per share is accepted in a shareholder meeting on July 28. Unfortunately, in this case, the interests of Entrust’s management are in serious conflict with the interests of shareholders. No wonder Entrust management seem more enthusiastic about the Thoma Bravo offer than they do about the other offers that have come along (as Kirchner explains in a more recent article). It seems perverse that the recent severe drop in the stock market has created an opportunity for company management to profit at the expense of shareholders. Kirchner believes that if the current offer is rejected, other higher bids will come. I’ll be watching to see how this soap opera plays out. A friend of mine came oh-so close to a $15 million win in the July 10 Ontario Super 7 lottery. His group of 14 players matched 6 out of 7 winning numbers. He likes to tell the story to that point and have people guess how much he won. Some people guess that his share would be a few thousand dollars. More experienced lottery players guess smaller amounts, but few people get close to the right answer: about $118! How could the top prize be $15 million, but hitting all but one number pay the group only $1652.50? It turns out that when choosing 7 numbers from 1 to 47, there are 280 combinations that are off by one number. So, right off the bat, we expect the 6 out of 7 prize to be 280 times smaller. The next thing to take into consideration is that the top prize collects 73% of the prize pool, but the 6 out of 7 prizes share only 5% of the prize pool. Now we expect the 6 out of 7 prize to be an additional 73/5 times smaller. Overall, this lesser prize is now 4088 times smaller. Finally, any prizes not won on a given draw are carried forward to the 7 out of 7 prize for the next draw. This inflates the 7 out of 7 prize even more relative to the 6 out of 7 prize. Now we see why my friend’s prize was over 9000 times smaller than it would have been if he had matched the last number. I’d like to think that all of this would discourage people from playing the lottery, but I suspect that such a “near miss” would spur most players to keep buying tickets. Personally, I like to go for the most certain lottery win by never buying a ticket and saving my money. We frequently hear people claim that we’re in a “stock picker’s market” or that a “sideways market favours stock pickers.” Superficially the logic of this can seem compelling: When stock market returns are low, you can only get a high return by picking the right stocks. But, this logic doesn’t hold up to analysis. Problem #1: Identifying the type of market. When someone says “we’re in a sideways market,” this is a prediction that short-term stock returns will be low. This prediction may be based on the fact that returns were low in the recent past, or may be based on other factors, but there is little evidence that anyone can predict short-term returns. I simply don’t believe that any commentator really knows what will happen in the short term. Problem #2: Stock pickers don’t outperform, on average. Even if we knew that returns will be low for the next year, who says that a stock picker will pick the right stocks to get higher returns? Because of trading costs, the average stock picker must get lower returns than the market average. The next time you hear that we’re in a stock picker’s market, you may find that the source of this wisdom is someone who makes a living picking stocks with other people’s money. I don’t waste a lot of time feeling guilty about things, but it wouldn’t be too hard to feel guilty about succeeding financially because others make poor financial decisions. Let me explain. I have saved my money and have put some of it into Canadian bank stocks. Many people get second jobs to pay the interest on their credit card balances, and some of these interest payments flow back to me in the form of bank stock dividends. Similarly, the value of my shares in retail stocks goes up because other people shop compulsively. We have all heard the sound financial advice to save some of your income and invest in stocks for the long term to get rich slowly. Once you have enough money, you can stop working if you like. But this advice only works because most people don’t follow it. If everyone saved and invested for 20 years, we couldn’t all quit working. There aren’t enough young people to do the jobs that keep our society functioning. If we all saved and invested, stock market returns would have to drop, and the advice on how to get rich wouldn’t work very well any longer. My investment success depends on other people handling their money poorly. Would we all be better off in the long run if everyone handled their money better? I’m convinced that those who handle their money well now would be worse off for a while if the poor money handlers suddenly wised up. But in the very long term, would greater efficiency cause everyone to benefit? Of course, this is an academic question because it is extremely unlikely that everyone will suddenly smarten up financially. If you have credit card debt, do your best to pay it off, even if it hurts me financially. 1. Fresh from his win in the big W network expert challenge, Preet gives details on Ontario’s new $10,000 rebate on electric cars. 2. Larry Swedroe explains why active stock picking can’t beat indexing, on average, under any type of stock market conditions. 3. Thicken My Wallet lists 5 warning signs that you may have improper insurance. 4. Larry MacDonald finds some misleading information on the iShares web site. His warnings are important for anyone looking to build a portfolio with ETFs. 5. Canadian Capitalist does a breakdown of what assets are best suited to the different types of trading accounts. 6. Million Dollar Journey compares monthly income funds from the major Canadian banks. 7. Big Cajun Man does a reprise of his rant about how the government hates single income families and taxes them more heavily. Good anger. A common misconception about Ponzi schemes is that the criminal running the scheme runs off with all the money owed to investors. In reality, by the time the Ponzi scheme collapses, there is no money. Imagine the following simplified Ponzi scheme. Bob, the friendly financial guy, gets people to invest $500,000 (inflation adjusted) with him each year. Bob reports a return of 5% above inflation every year to his investors after his fees, and the investors withdraw 10% of their money every year. However, in reality, the financial statements Bob sends out are lies because he is only making a return of 3% above inflation, and he has been taking $100,000 of investor money each year to spend on himself. This means that the amount of money invested is actually less than the total Bob reports to his investors. Unfortunately for Bob, investors withdraw 10% of the larger fictitious amount each year. The following chart shows how the claimed assets and real assets grow over the years. From the chart we see that Bob runs out of money in the 28th year. In the first few years, the shortfall was small, and Bob could convince himself that he could make up the difference if he had to. By the 10th year, it is becoming obvious that the gap is too large to make up, but real assets are still at a comfortable level. After 20 years, it’s apparent that the scheme will eventually collapse. Bob is in way too deep now to save himself. Complete collapse happens rapidly in the last few years. The important thing to note is that the claimed assets that investors see on their account statements are a fantasy. The money doesn’t exist. When Bob goes into hiding, only a tiny percentage of the money owed investors is available to return to them. Yet another suspected Ponzi scheme has surfaced in Montreal. Financial advisor Earl Jones has disappeared owing investors an estimated $50 million to $100 million. If this turns out to be a Ponzi scheme, then this money doesn’t actually exist because old investors get paid out of new investors’ capital. 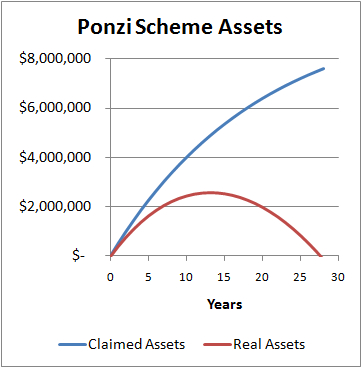 Typically, Ponzi schemes are detected when the economy goes bad and many people need to draw on their savings. The demand for cash overwhelms the ability of the criminal running the Ponzi scheme to find new investors to supply the needed cash. As more of these schemes are uncovered, the call for regulation gets louder. In some cases, opportunist organizations simply call for self-serving changes to laws. But, what rules would actually detect Ponzi schemes in their early stages? The key difference between legitimate financial firms and Ponzi schemes is that the legitimate firms actually control assets that match the total amount on statements sent out to investors. In Ponzi schemes, the pot of money invested is smaller than the total amount owed to investors. The obvious fix is to require periodic auditing to ensure that enough investments exist to back up the amount owed to investors. Mandating audits would serve auditors nicely, but protection is needed from criminals who simply shop for auditors willing to take outsized fees to look the other way. Perhaps a requirement for a different auditor every few years, or having an auditor assigned by some independent organization would help. The down side of all this is that it would likely drive up auditing costs for legitimate financial institutions. There is room for creativity here to reliably detect cheaters, but keep costs reasonable for the honest majority. We tend not to think much about the contracts we sign on a fairly regular basis. Almost every time you sign something you are essentially signing a contract. Most of us don’t bother to read these contracts, but I sometimes do read them and I’ve noticed something interesting. Frequently, if I look for the fattest paragraph in the latter half of a contract, the latter half of this fat paragraph will contain something unpleasant. It could be that I’m guilty of confirmation bias, but it could also be that those who write these contracts are doing their best to hide the controversial parts. Applying this rule to my credit card agreement, I found that if a charge in a foreign currency gets reversed, I won’t get all of my money back. I’ll lose out on the dollar conversions in each direction. Applying the rule to a consulting contract, I found that I was to be liable for any costs if the company infringed a patent. This was to apply to any part of the large project and not just the part that I worked on! It would certainly make things easier if we could always find the worst part of a contract by finding the fat paragraph. How you ever been to see a doctor who is obviously upset about something that has nothing to do with you? This has happened to me a couple of times where a doctor was complaining about something and I had little choice but to sympathize even though I was much more concerned about my own problems. Otherwise, why would I be seeing a doctor? One of these times the doctor was having a problem with her extended health coverage for topping up the basic government medical coverage. Her partners wanted her to go in with them on a plan that cost $400 per month for each doctor, but she saw in the fine print that the plan had a lifetime cap on all benefits of $25,000. She correctly figured out that she would pay $25,000 in premiums in just a little over 5 years. I asked her if she could afford to pay $25,000 right now if she had some sort of medical problem, and she said yes, which isn’t too surprising for someone with the income of a successful doctor. So, this means that the insurance company wouldn’t be reducing her financial risk very much. Both the doctor and the insurance company qualify as rich for the amounts of money at stake here. It must be that one of the two parties was getting a bad deal, and in this case, it was the doctor. The doctor would have been better off with a plan that only paid for treatment costs above some amount, like $5000 per year. She could easily afford the first $5000 each year, and the premiums for this type of insurance would be much less than $400 per month. Such a plan would actually protect her against real financial risk instead of only covering an amount she could easily afford anyway. The various medical insurance plans I have had through employers had similar problems. There were yearly caps on all types of coverage: $500 for physiotherapy, $200 for glasses, etc. These plans were nice to have, but they weren’t really insurance because they didn’t reduce my risk of financial ruin. I just thought of them as a little extra income. If any expensive medical problem came up, I was on my own. 1. Larry MacDonald makes some good points about government waste in his taxpayer's rant. This reminds me of a quote I once heard: be thankful that you don't get all the government that you pay for. 2. Canadian Capitalist tries to predict which ETFs are likely to close. 3. Preet gives a financial literacy test in just 3 questions. If you get any of them wrong, you're at significant risk of having others take advantage of you financially. 4. My Dollar Plan has some good advice about learning the financial impact of everyday purchases by annualizing their costs. 5. Big Cajun Man weighs the pros and cons of a Costco membership. 6. Frugal Trader advises us how to organize a garage. Most people need to repeat step 1 a half dozen times until they get it done completely (get rid of stuff you don't use). One negotiation tactic that has worked on me in the past is strategic use of silence. When a gap in conversation gets long enough most of us have an irresistible urge to fill in the gap with something, anything. The problem comes when negotiating and you jump in to fill a gap with a concession. It’s not just high-powered business negotiations that I’m talking about here; it could be negotiating over whose turn it is to wash the dishes. Since I first learnt about silence as a negotiating tactic, I’ve recognized it being used by others many times. One long gap in conversation was on a telephone call with a lawyer seeking ridiculous concessions on a consulting contract. We didn’t talk for about 15 seconds, which may not sound long until you’re actually sitting there holding the phone for an apparent eternity in silence. Fortunately, I knew about the use of silence and didn’t break the tension by agreeing to indemnify the other company against patent problems related to the project. More interesting information about the use of silence while negotiating is available in a piece written by Michael Schatzki. In a study of the winner’s curse (full text here), researchers conducted experiments to see if poor value estimation skills were really the main cause of overpaying at auctions. These experiments involved having people participate in auctions under different conditions. The main difference was that some auctions were conducted with several people, and others had people compete against a computer algorithm (and they knew that is was a computer). The results showed that when people outbid a computer algorithm, their bids tended to remain at rational levels. However, when people compete against other people in an auction, the winning bid tends to be significantly higher. This suggests that people tend to become competitive and willing to overpay just so that they won’t “lose” to another human bidder. Of course, the real loser is usually the person with the highest bid. So, if you’re thinking of bidding on real estate or cars or other high priced items, you should consider keeping your competitive instincts in check and gracefully conceding to another bidder who goes above the maximum price you decided on in advance. My last credit card statement arrived in the mail last week and was unusually thick. I’m used to receiving an extra piece of paper or two, but this was really thick. It turned out to just have a new cardholder agreement, a new certificate of insurance on purchases (12 leaflet pages), and smaller pieces of paper inviting me to read the longer pieces of paper. One of the changed sections concerns the cardholder’s responsibility for fraud. Cardholders aren’t responsible for any fraud as long as they meet a list of criteria such as not knowingly contributing to the fraud, notifying the credit card company within 24 hours of noticing a problem, and having an account in good standing. The last part about having an account in good standing caught my eye because it happens that I forgot to pay my bill on time last month and made an oversized payment (to break the cycle of interest charges) about 10 days late. Unfortunately, I couldn’t find a definition of “account in good standing” anywhere in the agreement or online. Was my account not in good standing for those 10 days, or does my payment have to be later than 10 days for my account to be not in good standing? Maybe my account will remain not in good standing for some number of months after this incident. So, I have no idea if this oversight has put me at risk if a fraudster starts using my credit card number. I may have been at risk for 0 days, 10 days, or longer. Any insight into whether credit card companies tend to make use of this loophole and what the precise definition of “account in good standing” is would be appreciated. The UK Financial Services Authority plans to make big changes to the way that investment advisors are paid starting in 2012. They plan to make any fees charged to investors much more transparent. The blog Where Does All My Money Go reported the changes as so surprising that they seem like an April Fool’s joke. (Full text of the discussion paper is available here). Currently, investors as a group know little about how their advisors get paid. This is true in the UK as well as Canada and the US. In fact, many investors think that they don’t pay anything to their advisors. The truth is that managers of financial products, such as mutual funds, offer commissions to advisors as an incentive to recommend their products. These commissions are paid from investors’ money, but most investors have little idea how much they are paying for their investment advice. The changes coming in the UK promise to make the system much more transparent. Fees are to be negotiated between investors and advisors, and managers of financial products won’t be able to offer incentives to advisors. It will still be possible to have advisor fees paid out of invested funds, but the goal is to make investors aware of how much they are paying. There is still plenty of time for the UK investment industry to fight these changes or water them down. We’ll have to wait and see how these changes get implemented. Similar changes would be good for investors in Canada. Under the current system, an investor who invests $100,000 in mutual funds might pay a $5000 commission up front and $500 in trailers each year. Many investors would balk if they knew how much they were paying. Transparency of fees would lead to a huge shakeup in the investment advisor industry. Some financial decisions, particularly about insurance, must take into account what is called the utility of money to get the right answer. Normally the concept of utility is explained in very mathematical terms, but it doesn’t have to be. Let’s take a fun example straight from a game show. You’re standing beside Howie Mandel playing a super-sized version of Deal or No Deal. You’re down to just two amounts left, 1 cent and $3,000,000! You get the following offer: take $1,000,000 now, or take a 50/50 chance at the $3,000,000. What should you do? If you got to do this many times, then on average, taking the chance you would win half the time and get an average return of $1,500,000. This is more than the million dollars you were offered, and so you should take the chance, right? Not so fast. Most people would correctly figure out that they should just take the million dollars. The reason is that the first million would make a huge difference in their lives, and an additional two million doesn’t have the same impact. This is exactly what we mean by the utility of money: how useful the money is to you. The more you have, the less useful the next dollar is to you. So, if you are already rich, the first million isn’t as big a deal, and you should probably take a chance on getting the full three million. But, if you aren’t rich, and that first million would completely change your life for the better, then you should just take the million that was offered. One simple model for the utility of money is to view things in percentage terms. Suppose that everything you have in the world, including future earnings above the amount you need to live, adds up to $250,000. Then a million dollars increases your net worth by 400% to $1.25 million. Adding another two million dollars to this is a 160% increase, which is less than the first 400%. So, the extra benefit of taking a chance in the game isn’t worth the risk. For a rich person who starts with a net worth of $4 million, the first million adds 25% to make $5 million, and the next two million adds 40% more. For this person, the risk is worth it. All this explains why a car insurance company with deep pockets is willing to take on risk, but individual drivers are better off paying a little extra to reduce risk. 1. Scott Adams of Dilbert fame has a funny and thoughtful demonstration that your bank hates you. 2. Larry Swedroe has a great series on bad investments (starts here) that includes some words to live by: "the more complex an investment product, the faster you should run from it." 3. Canadian Capitalist commented on the 5-cent levy on grocery bags that generated a lot of interest and discussion. 4. Big Cajun Man suggests that executives of financial companies should use the products that they sell to the public. 5. Million Dollar Journey has a post by Kathryn about how she gently coaches people to learn more about handling their money. 6. Thicken My Wallet has some advice for negotiating effectively. 7. Preet gives a performance update of the blogger's stock picking contest. His portfolio is deliberately selected to have very high volatility, but somehow his results are close to the median so far. According to Sports Illustrated magazine, 78% of NFL football players are broke within two years of retirement. NBA players fare a little better with an estimated 60% of them broke within five years of retirement. Treat every sports payment as though it is your last one. I feel safe giving this advice for two reasons. Firstly, it is very conservative and the likelihood of getting into trouble with it is low. Secondly, there is a good chance that no athlete will ever follow this advice. I don’t believe that this rule is too conservative. A career-ending injury can happen at any time. Even so-called “guaranteed” contracts have outs for the team if the player is caught engaging in some prohibited behaviour. Any payment could be the last one. The implications of my rule can be sobering for the young athlete anxious to live it up. After contracts are signed but no payments made, the athlete shouldn’t begin spending any future income at all. Even after a $1 million signing bonus is paid, the athlete should think in terms of spreading this out over the rest of his life just in case that’s the last sports money he ever gets. Some advise the 4% rule as the most that should be spent from a lump sum each year to then have the principal grow with inflation. The $1 million signing bonus becomes $40,000 per year or a modest $3300 per month. Of course this 4% would have to be reduced to account for any management fees paid on investments. The 4% would have to be reduced further if too much of the money is invested in low-yield investments like bonds. Even an athlete who has accumulated a wisely invested $10 million would have a budget of $33,000 per month, which would require a few months of saving to buy a fancy car. The reality of the length of a human life makes large sums of money, like lottery winnings and sports contracts, look small when spread out over a lifetime. Happy Canada Day! This is a special Canada Day version of the usual Sunday feature looking back at selected articles from the early days of this blog before readership had ramped up. Enjoy. Insurance is a financial matter and doesn’t actually do anything to prevent accidents. So, if insurance is just about trading money back and forth, how can it be a good deal for both the insurance company and the person buying the insurance? When it comes to buying goods like food, it is easy to see why an apple is more valuable to a person buying one than it is to the farmer who owns an orchard full of apples. I’m quite happy to part with 50 cents for an apple when I’m hungry, and farmers are willing to take less than 50 cents for each of their apples. So, in this case, it is possible for both sides to win. When it comes to insurance, it isn’t as obvious that both sides can benefit. To keep things simple, imagine that a car insurance company has worked out that they will have to pay out an average of $600 per driver in claims for car accidents next year. If they charge each driver $1000 for the insurance, then they will make a $400 profit on each driver minus administrative costs. But, doesn’t this mean that each driver is making a bad deal and is wasting $400? Not exactly. If we knew that each driver would claim exactly $600 for accidents during the year, then it would be a bad deal for the drivers. But, the majority of drivers will make no claims, and a small number will make large claims. If two cars are totalled, the claim could be $50,000 or more, and if people are injured, the claim could be $1,000,000 or more. Losses like this for the average person can be devastating financially. It is worth paying a little extra to avoid a small chance of losing everything you have. This type of reasoning takes the “utility of money” into account. I’ll have more to say about the utility of money on Sunday.